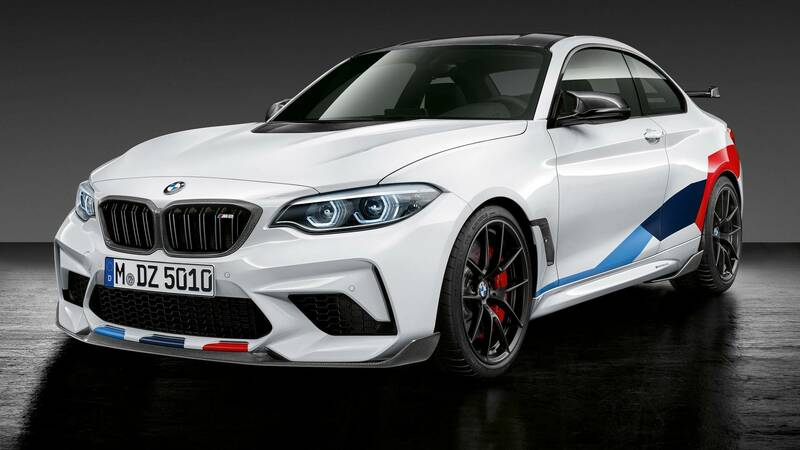 It was a little over two weeks ago when BMW retired the standard M2 to make room for the M2 Competition and now the Bavarians are already presenting upgrades a customer can add to make the performance coupe even more intense. 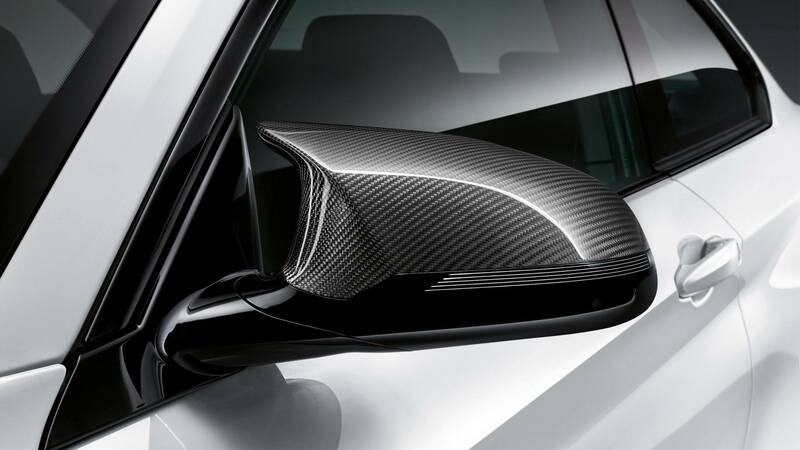 Aside from boosting the car's visual appeal, the extras also serve another purpose: to shave off weight. 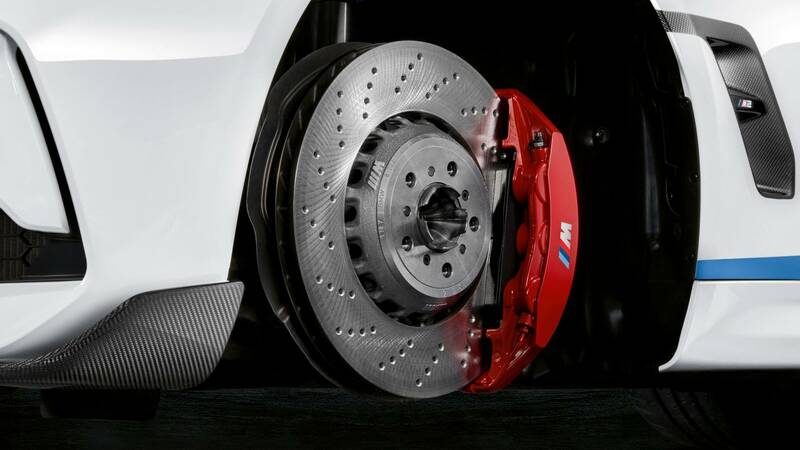 Those 19-inch forged wheels from the M Performance catalog not only look good, but they also reduce weight by 3.2 kilograms (7 pounds) compared to the model's regular alloy wheels. 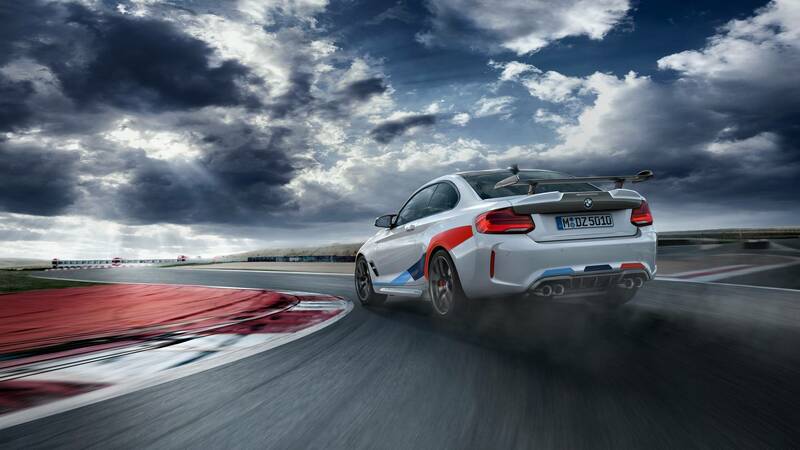 According to BMW, the diet has a positive impact on the steering behavior as well as the driving dynamics. 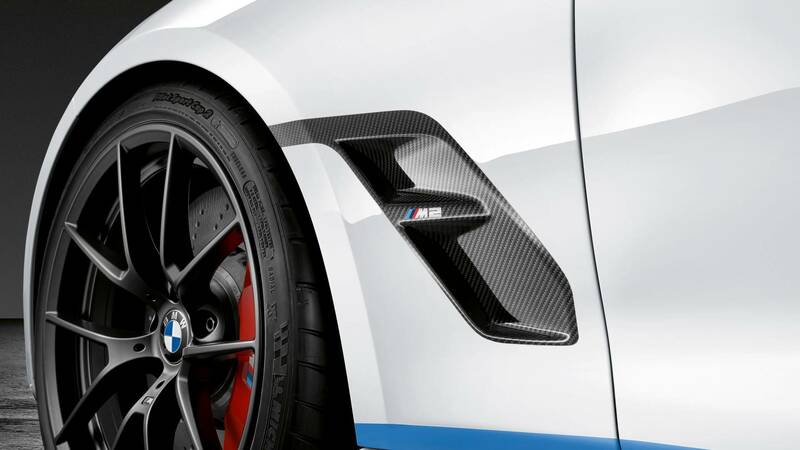 Finished in either matt Jet Black or Frozen Gold (with "M Performance" lettering, of course), the wheels can be optionally wrapped in Michelin Pilot Sport Cup 2 tires for superior grip. 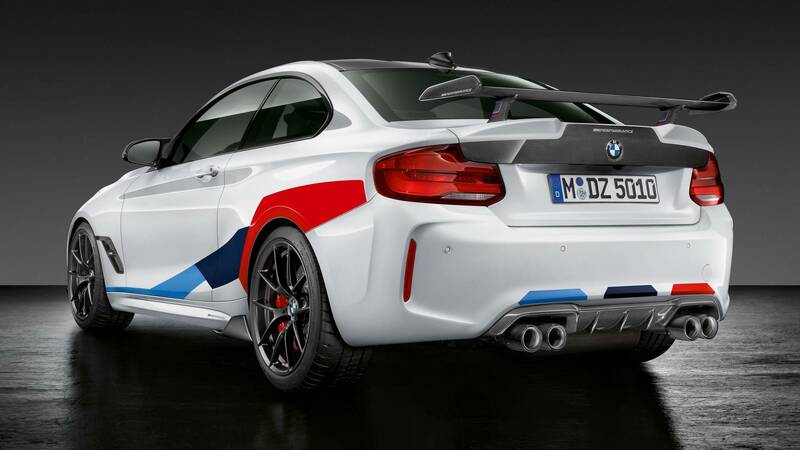 The M2 Competition's body can also go through a few changes to further cut fat. 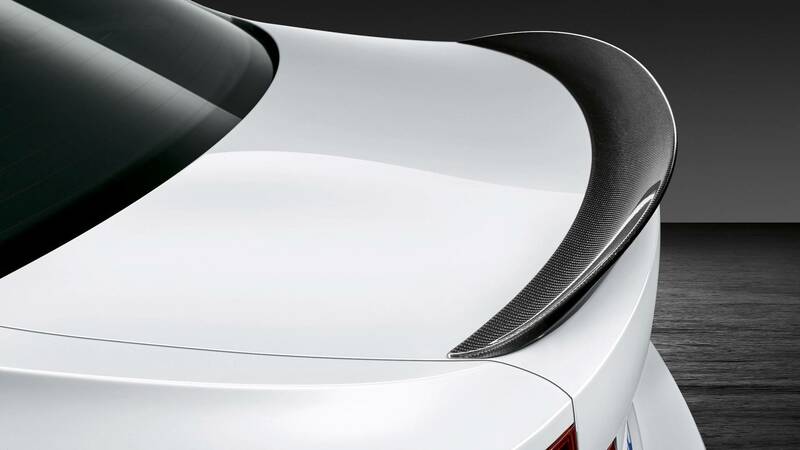 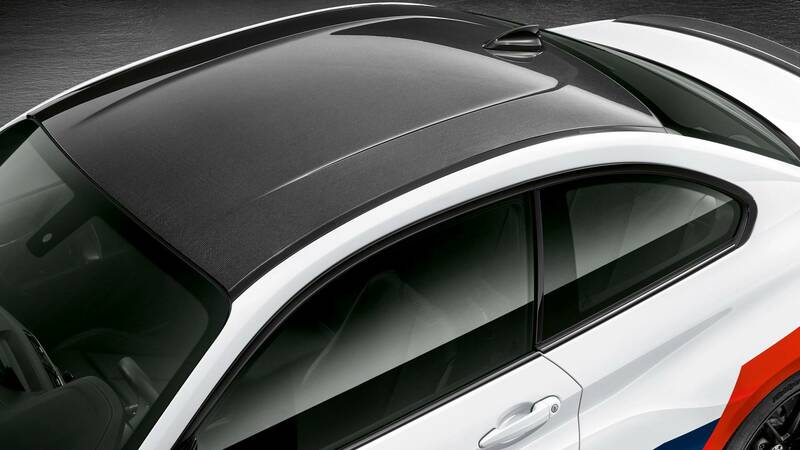 For example, the carbon fiber roof slashes about 5 kg (11 lbs), while the carbon fiber trunk eliminates a further 6 kg (13 lbs). 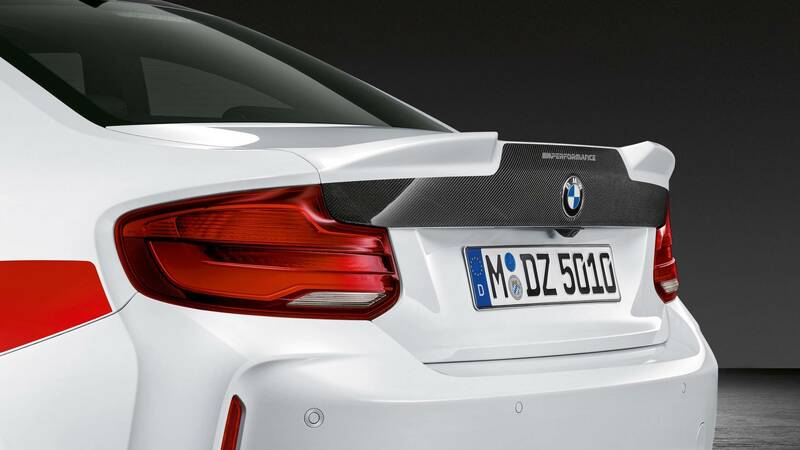 The bad news is you'll have to wait a while to order these as BMW won't have them on sale until November. 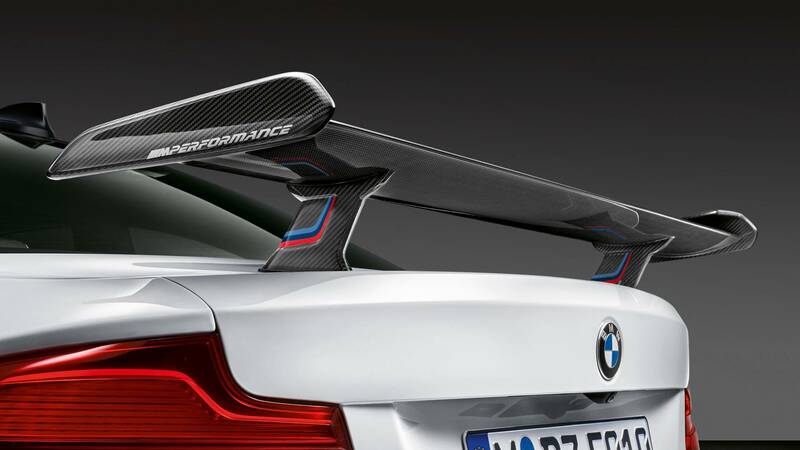 We think it's worth the wait considering the inside of the tailgate is made entirely from carbon fiber, so it's going to look great whenever you'll load or unload cargo from the trunk. 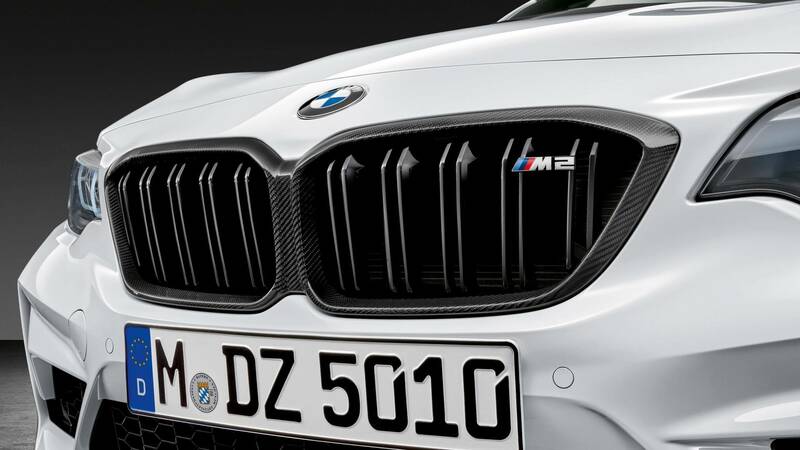 The carbon fiber treatment doesn't end there as the M2 Competition can also be optionally ordered with a new hood made from the same lightweight material to reduce weight by an additional 9 kg (20 lbs). 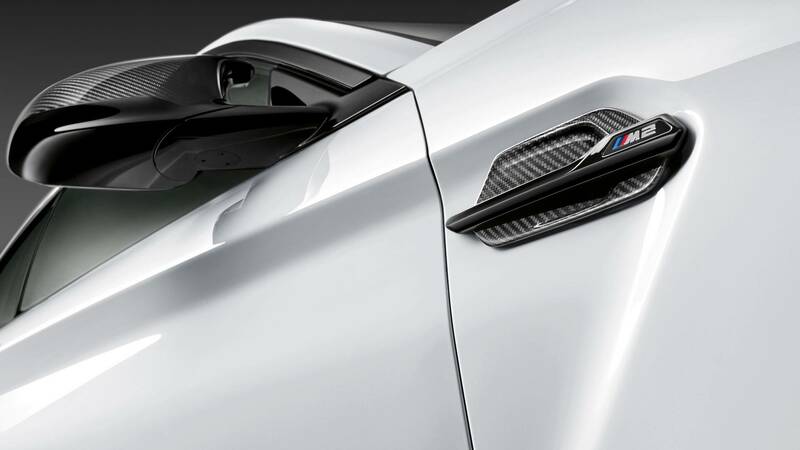 It also boasts a powerdome to enhance the coupe's sportiness, while the extra front side panel made from carbon fiber has the same effect. 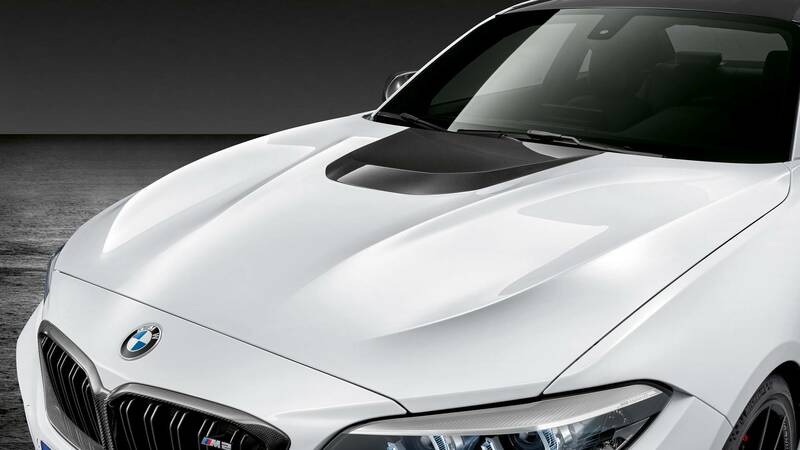 You can't have the latter right away as BMW will offer it beginning with the same month of November. 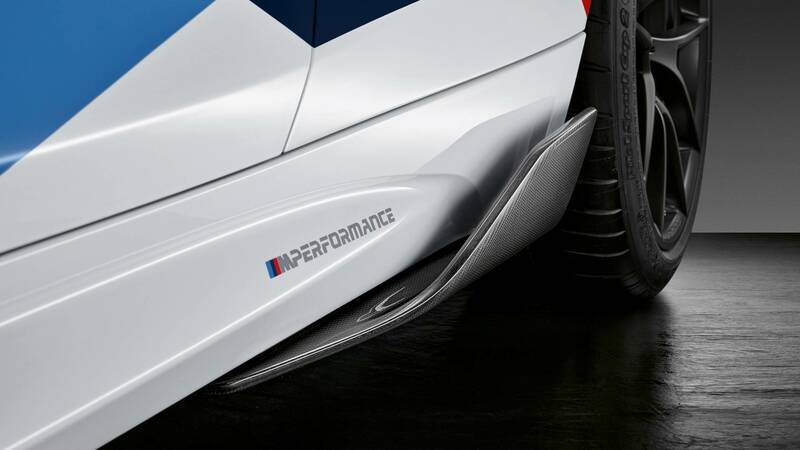 Those willing to reach even deeper in their pockets can get the M Performance stainless steel exhaust with a titanium rear silencer and 93-mm carbon fiber exhaust tips adorned with the "M" logo. 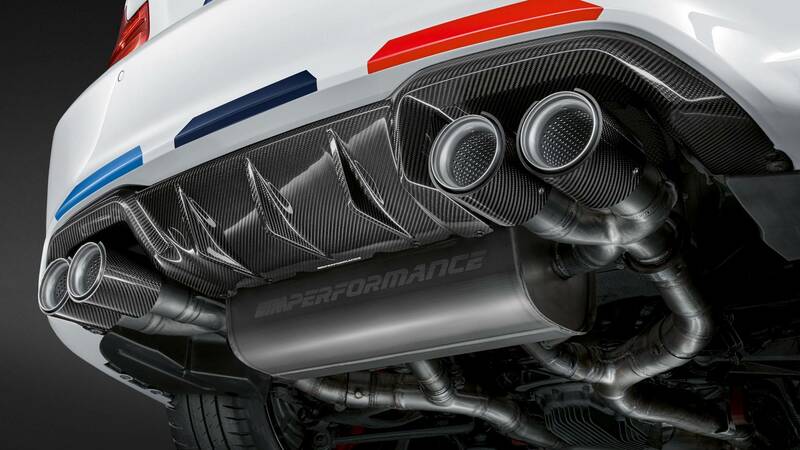 The new exhaust shaves off 8 kg (18 pounds) and offers a more aggressive engine note. 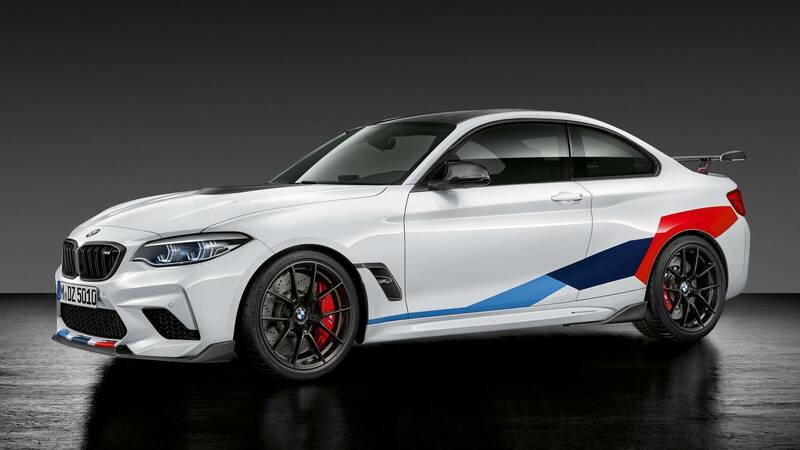 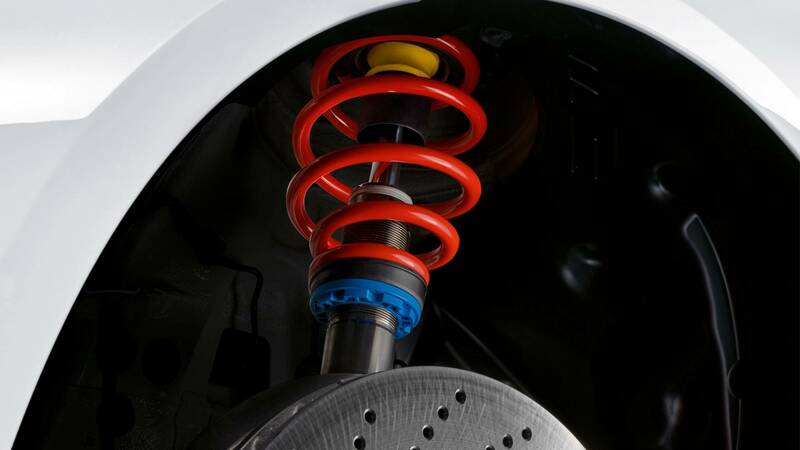 Other upgrades available for the new M2 Competition include bigger motorsport-derived brakes and a coil-spring suspension lowering the ride height by 20 millimeters (0.8 inches). 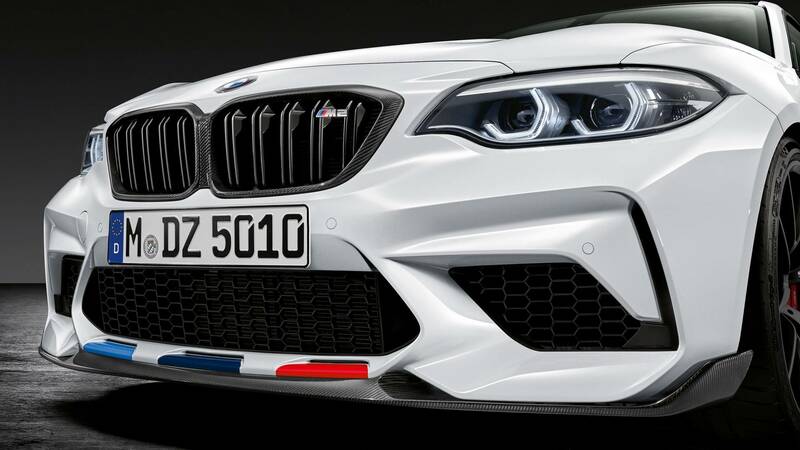 Miscellaneous items include LED door projectors, two sports steering wheels, stainless steel pedal covers, and even M Performance-branded floor mats along with a car cover if you really want to go to town.